I got my profile from Aussie Home Brewer. I've been tweeking a 20l BM profile in iBrewmaster and have never missed an OG by more than a point. Mash, sparge, boil and final volumes are all perfect. I'd definitely recommend this software for BM users... Ps this is my first post, what a great site, so hard to find other BM enthusiasts. When I replied to Brad Smiths last request for ways to improve his software I suggested the same thing and a few days later he emailed me asking me to contribute an equipment profile and other details. I have forwarded him my profile for my BM and a recipe so that he may pick all other details pertaining to the 20l BM and his software. Dicko wrote: When I replied to Brad Smiths last request for ways to improve his software I suggested the same thing and a few days later he emailed me asking me to contribute an equipment profile and other details. It would be interesting to know if he has asked a 50litre owner the same thing...I guess he would have. 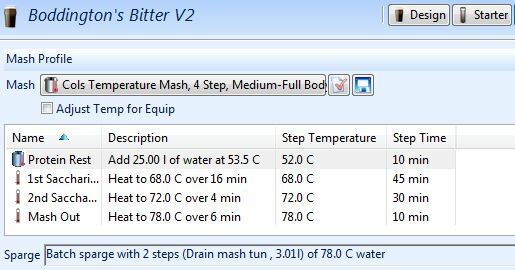 Imo the software at the moment does not cater for mashing in with 25 litres as with the BM20 and then sparging with 7 or 8 litres and the default grain absorption amounts appear to be incorrect for the BM. Dicko wrote: It would be interesting to know if he has asked a 50litre owner the same thing...I guess he would have. Did you know that you can adjust the grain absorption rate in the 'Advanced Options' ? I've set mine to be the same as BIAB and it is quite close. In my recipe I adjust my initial volume to be 25L and my current equipment profile gives me the sparge volume I need for that gravity of beer. I find my grain absorption is about 1:1 (eg. 5.5kg of grain = about 5L of absorbtion) - seems really high to me! whitegoose wrote: I find my grain absorption is about 1:1 (eg. 5.5kg of grain = about 5L of absorbtion) - seems really high to me! After watching one the Aussie's on Youtube I move my malt pipe to an FV which has the upturned BM lid on it and allow it to drain for a good 20 mins so that I get as much out of the grain bed as possible. Last edited by swiggingpig on Tue Mar 18, 2014 11:04 am, edited 1 time in total. I used the BIAB setting as well and that got me close. I do the same as you for my sparge volumes....25 litres dough in leaves the total water needed minus the 25 litres = the sparge amount. BM specific options would be terrific. Much more substantial software. Calculators and timers galore. Did NOT import any of my previous data which I've rationalized as a brand new Speidel BM start for me and no great loss..... it's a little jerky jerky, crashing occasionally but restarting immediately. Last edited by mrpilsner on Wed Jun 25, 2014 3:35 pm, edited 1 time in total. Re: RE: What software are you using? I could help, with the coding part if needed..
Are there any new updates regarding this topic? It would be great to hear which software I could best use for the 50 liter (2015) version. https://brewfather.app - recently added Speidel equpiment profiles.